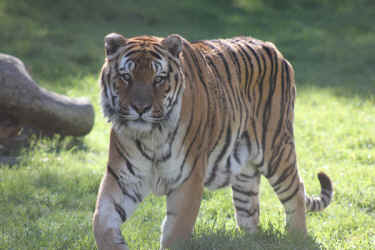 Nine years ago, Ravi was one of the first tigers to come to PAWS from a life of severe neglect and cruelty at the Colton "Tiger Rescue" facility. The conditions there were horrific - tigers were starving, sick, and fighting constantly. Many had open, untreated wounds. When we first met Ravi, his entire right hind leg was swollen, his footpads were cracked, his coat was dull, and he had a deep wound in his paw. After giving Ravi time to settle in to his new home at PAWS, our veterinarian Dr. Jackie Gai examined Ravi and took x-rays of his swollen paw and leg. A deep, longstanding infection was found and despite intensive efforts to treat it, the infection had spread to the bone. His toe was amputated at UC Davis, and he recovered quickly with the pain and infection gone. On a balanced diet, and no longer having to fight for his food, Ravi's coat grew radiant, his footpads supple, and his calm, regal personality emerged. Ravi's transformation from a state of illness and fear to one of health and confidence was amazing to watch. Ravi could often be seen lounging in the tall green grass at ARK 2000, strolling under the oaks, and snuggling up to Amelia, who absolutely adored him. Ravi lived a wonderful, enriched nine years with us until finally losing his battle with chronic kidney failure on April 8th, at the estimated age of 20 years old. He was a big presence, a survivor, and a gentle soul. He will be missed by all.